Primary Transparent Set: A set of 6 x 60ml bottles of classic paints, trans lt blue, trans lt green, trans yellow, trans red, opaque white, opaque black. shrink wrapped & ready for use. superb for textiles, leather, wood, ceramics & most porous substrates. Tropical Transparent Sets: A set of 6 x 60ml bottles of classic paints, trans brite red,flaingo pink,sand,tropical green,maui blue,canary yellow. shrink wrapped & ready for use. superbn for textiles, leather, wood, ceramics & most porous substrates. Primary Opaque Set: A set of 6 x 60ml bottles of classic paints, blue, yellow, red, lt green, black, white. shrink wrapped & ready for use. superb for textiles, leather, wood, ceramics & most porous substrates. 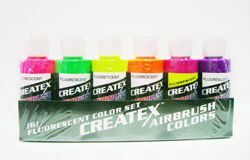 Florescent Set: A set of 6 x 60ml bottles of classic paints, trans brite red,flaingo pink,sand,tropical green,maui blue,canary yellow. shrink wrapped & ready for use. superbn for textiles, leather, wood, ceramics & most porous substrates. Pearl Set: A set of 6 x 60ml bottles of classic paints, shrink wrapped & ready for use. superbn for textiles, leather, wood, ceramics & most porous substrates.